Kohler Santa Rosa Toilet not only gives your bathroom an elegant and luxurious touch; it also promises to make you feel comfortable as it is ADA compliant from all perspectives. Read our Kohler santa rosa review to learn more. Kohler is one of the biggest and leading brands that manufactures some of the best toilets in the industry. The Kohler’s Santa Rosa is a single-piece toilet and comes in 7 beautiful and elegant colors. It offers you a mid-priced toilet with outstanding features and excellent performance. 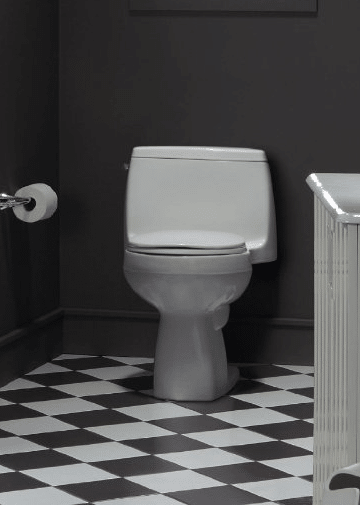 Kohler is not only among the top selling toilet brands in the USA but is well-known for its quality and reliable service that is the primary cause of its increasing customers. While the toilet stands out from other brands because of its unique design and making every staring eye envious of it, it also offers a very reasonable and competitive price. Unlike most of the toilets, that makes it difficult for you to relax and unwind, the best Kohler Santa Rosa Toilet not only gives your bathroom an elegant and luxurious touch; it also promises to make you feel comfortable as it is ADA compliant from all perspectives. Its smart ergonomics swear not to consume any extra space at the time of installation making it ideally perfect both for small or large sized bathrooms. Another thing that you would appreciate is its fantastic flushing system. It’s a combination of swirling and the shooting effect. When flushed, the water, rather than swirling down the toilet’s bowl, shoots out with the pressure that gives you a neat & clean toilet after every use. The only thing that the company was left with to focus on was the ease of cleaning, and Kohler Santa Rosa is no exception to this. Being a single-piece toilet and having very few parts, the toilet is comparatively easier to clean than most of the two-piece models. Here is a detailed overview of some of its immense and appealing features. Undoubtedly, Kohler’s will dominate the plumbing and sanitary industry with such amazing products. No matter how much a toilet offers exceptional features, specifications, and elegant design. If it doesn’t have a powerful flushing system, it looks like an ugly fixture in your bathroom. However, Kohler Santa Rosa has the most powerful flushing system that is water efficient as well. It uses only 1.28 gallons per flush. Though it may seem a very less quantity of water, the added boost and shooting mechanism increases the power and effectiveness of the water upon each flush. Its fully glazed trapway helps to clean the toilet thoroughly with a single flush and also prevents the clogging. Kohler Santa Rosa Toilet is made from vitreous China and has a unique design that gives your bathroom a beautiful and glossy appearance. It has an elongated seat with a comfortable height that makes it perfect for all age groups. Though being elongated, its corners are rounded that aids in cleaning and preventing any tight corners where mold, mildew or smell causing bacteria may grow. It has a trip lever and shiny surface that matches with the other fixtures in your bathroom. 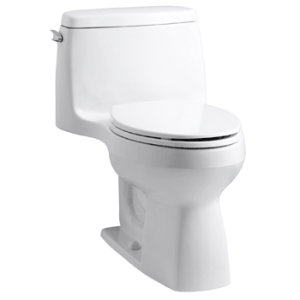 Kohler Santa Rosa Comfort Height Elongated Toilet only consumed 1.28 gallons per flush. This is, in fact, a full flush with a smart flushing mechanism and low water consumptions. It can remove a significant amount of waste in a single flush, and this makes the Santa Rosa EPA Water Sense certified. The benefits of Water Sense toilets makes you eligible for rebates on your water bills. The toilet has a 12 inch rough in and being a single unit it makes it easier for you to install it in your bathroom. There is an instruction manual that guides you how to work out on the bolts, nuts and fixing. You require minimal DIY skills to install Santa Rosa toilet. However, the option to hire an expert plumber is always available for you. Whether it be water consumptions, installation or cleaning, Kohler has made their toilets efficient from every perspective. Firstly, its flushing system using AquaPiston technology that forces the water to shoot into the bowl of the toilet, easily cleaning a large amount of waste material. For external cleaning, the company made smooth and round corners that inhibit the growth of bacteria and mildew. Moreover, Santa Rosa is a single unit toilet with few parts making it ideal for quick and easy cleaning. You can use your regular toilet detergent for cleaning it. Though a 1-year limited warranty backs it, it has nothing to do with its quality, performance, and durability. Santa Rosa users have been using this innovative toilet for several years without any issues in its quality or powerful performance. Not to mention that Kohler’s Santa Rosa toilet is built with a comfortable height that makes seating and standing comfortable. It also makes it ideal for elderly and disabled people. Has a fully glazed trapway with AquaPiston flushing system. Comfortable height making it perfect for elderly and disabled people. Boasts EPA Water Sense Certification. Also has a Seat and lid that comes with the toilet. Kohler is a humble Toilet Brand in the industry, and with such a reasonable price it offers immense and outstanding features to its users. It not only promises to deliver you quality, but also a healthy atmosphere in your bathroom that makes you feel good after every use. It doesn’t lag behind regarding personal hygiene, nor does on the level of comfort. Check out its price and Kohler Santa Rosa reviews on Amazon. 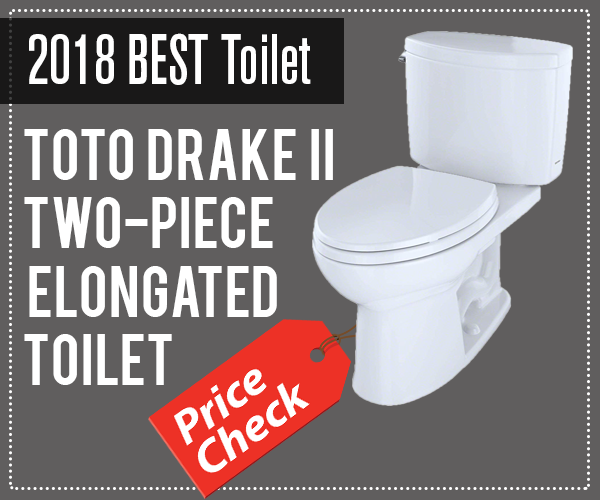 If this is not the right toilet for your needs, then check out our other reviews of toilets and comparisons and find the right one for you!